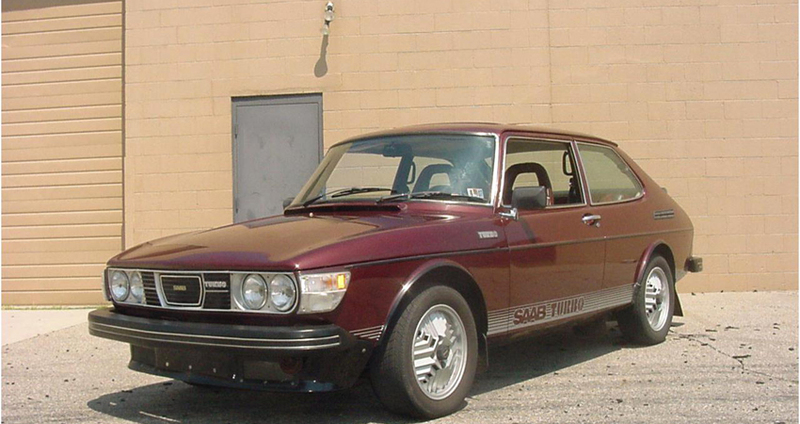 The Model 99 Turbo was Saab’s first production Turbo model and was imported to the United Sates in 1978, It was only available in the 3-door hatchback version. 2-door, 3-door and 5-door models were offered in Europe. The overhead valve 2-liter engine was turbocharged, utilizing a technology that helped deliver greatly increased low/mid speed torque to enhance driveability while delivering a 15% increase in horsepower for stunning high-speed performance. The heart of the technology was a computer controlled port fuel injection system that was superior to previous carbureted engines. Not only did this technology improve performance it also reduced emissions too. Distinguished from non-Turbo 99’s by its turbospecific alloy wheels, air dam, spoiler, instrumentation and upholstery, the 99 Turbo set a new direction for Saab performance. The 99 utilized a deeply curved front windshield, providing the best driver visibility, calling attention to the marque’s aircraft legacy. The hatchback, or Combi Coupé cars were exceptionally spacious, if not universally loved for their aesthetics. Also underscoring their aircraft lineage, the 99’s dashboard was curved to enable easy reach of all controls and featured gauges lit up from the front. Saab engineers placed all controls and gauges in the dashboard according to their frequency of use and/or importance so that the driver need not divert his gaze from the road for the shortest possible time and by the smallest angle.